The global foot orthotic insoles market was estimated to be around $3 billion in 2017 and is anticipated to grow at a CAGR of around 5.7% during 2018 to 2023. The 3D-Printed insoles is going to change the market dynamics with its ability to make the entire manufacturing process relatively easier and hassle free with a solid growth rate of 30.36% during the forecast period. 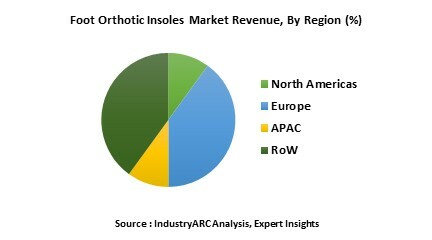 The Pre-fabricated foot orthotic Insoles contribute majorly to the revenue with revenue of $1.7bn. The U.S. held major market share in terms of revenue followed by Europe. What is Foot Orthotic Insoles? What are the major end users of Foot Orthotic Insoles? The various end users assed in the foot orthotic insoles market include sports, medical and comfort. In 2017, Medical was the dominant end use segment which accounted for more than 57% of the global foot orthotic insoles market revenue and is anticipated to continue its dominance during the forecast period. Comfort segment is anticipated to witness fastest growth during the forecast period. Foot orthotics is prescribed by podiatrist for foot problems such tendinitis, plantar fasciitis, bursitis, diabetic foot ulcer, and ankle, foot, and heel pain. It has been clinically proved that these foot orthotics suggested by podiatrist have reduced foot pain and improve the function. When a patient suffers from a foot dispositional disorder, such as calluses, may feel the pressure of their body weight spread throughout their feet with the help of customized orthotic insoles that inserted into their shoes. Custom fit 3D-Printed orthotics designed by Wiivs is customer biased fit design orthotics. The design will be generated automatically in the app based on the consumer feet pictures. This is anticipated to revolutionize footwear technology. The key players operating in the foot orthotic insoles market are Hange Prosthetics and Orthotics Inc., Superfeet Worldwide, Inc., Bayer AG., Hanger Inc., Ottobock Holding GMBH., Bauerfiend AG., Comfortfit Orthotic Labs Inc., and other 10 more companies.